Herreshoff - Description | W. W. Norton & Company Ltd. Elegant by design and spectacular in performance, thirty-six iconic Herreshoff boats are showcased in magnificent photographs and original drawings. 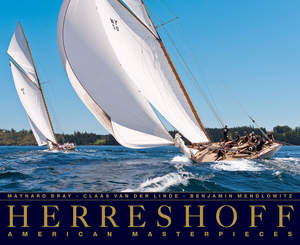 The Herreshoff Manufacturing Company constructed the most thrilling, innovative and graceful boats ever built in the United States. Here the finest of the Herreshoff designs afloat today are presented with insightful commentary on design evolution in every facet—from lines to displacement to hardware, accompanied by full-colour images of each vessel both in detail and under way, and unique colour reproductions of Herreshoff’s archival plans and drawings. Each entry incorporates a history of the boat (or class), its owners, race results and fate, celebrating the many that still grace the waters. America's premier photographer of wooden boats presentsthe best of his work from the past decade.